ww2dbaseNevada was the lead ship of her class. The Nevada, which was the first to introduce the superfiring triple turret into US Navy service, was an important design change for US battleships. In 1911-12 firing trials against the San Marcos (formerly the USS Texas, a veteran of the 1898 Spanish-American War, decommissioned in 1911) had revealed that medium and light armour was of no value against large-calibre armour-piercing shells. The Nevada and her sister vessel, Oklahoma, were therefore designed as the first US battleships to be armoured in the "all-or-nothing" system - adopted by other navies after World War I - whereby vital areas of the hull were screened by the maximum thickness of armour belt, kept narrow and capped by a thick armoured deck, while less vital areas of the vessel’s hull would remain unprotected. On the Nevada a 13.5-inch belt in a single strake ran for c.400 feet amidships and extended 9 feet above and 8 feet 6 inches below the waterline. This was closed off fore and aft by 13.5-inch transverse bulkheads to form a strong citadel over magazines and machinery. Heavy armour also protected turrets, where penetration by an incoming shell could, and in all probability would be catastrophic, the conning tower from where an engagement would have to be directed, the barbettes to protect the hoists and turret machinery, and the funnel base, but, apart from an 8in strake over the steering machinery aft, only the armoured decks protected the bow and stern. The secondary armament was left unprotected. ww2dbaseHer armament consisted of ten 14-inch guns installed in two triple-gun turrets (the first in US battleships) and two superfiring twin turrets, fore and aft. These were the first oil-burning US battleships (reciprocating machinery was fitted in Oklahoma) and had single funnels. During extensive modernization in 1927-29, both warships were reboilered with six Bureau-Express units and Nevada was given 31,300 SHP geared turbines taken from the stricken USS North Dakota (BB-29), a target ship since 1924. Additionally, horizontal protection was improved, Anti-Aircraft armament augmented and aircraft catapults fitted atop the third turrets (later repositioned over the stern). The Nevada's secondary armament was steadily increased throughout her war service and by 1944 consisted of no less than sixteen 5-inch dual purpose guns, forty 40-millimeter anti-aircraft and 36 x 20-millimeter, which increased the Nevada's crew complement to some 1,049 naval personnel. ww2dbaseUSS Nevada was commissioned before WW1, in which war she saw action near Britain as an American ship of the British Grand Fleet. During the inter-war years, she saw a flurry of activity which included serving in both oceans that flanked each side of the United States, a cruise to Brazil in 1922, and cruise to Australia and New Zealand in 1925. The cruise of Australia and New Zealand caught the attention of the Japanese, making note that the battleship of the United States could sail the span of the Pacific. ww2dbaseNevada was extensively overhauled in 1927-30 at Norfolk, Virginia, United States, exchanging her masts for tripods, receiving a new superstructure, relocating her five-inch secondary battery, installing new anti-aircraft guns, among others. ww2dbaseOn 7 Dec 1941, Nevada was moored in Pearl Harbor off Ford Island directly behind the USS Arizona. Nevada's Officer of the Deck was newly commissioned Ensign Joseph Taussig, Jr., son of a Vice Admiral, who had just graduated from the Naval Academy and was serving his very first watch as Officer of the Deck. Not only that, but on this Sunday morning, this Ensign was the senior-most officer aboard the battleship. Upon taking the Deck, Ensign Taussig ordered a second boiler lit when the normal practice for battleships in port was to run on just one boiler. He had no real reason for ordering a second boiler lit; he was Officer of the Deck and gave the order mostly because he could. When the Japanese air attack began, Ensign Taussig, who was primarily a gunnery officer, quickly directed Nevada's anti-aircraft guns to go into action as the ship was struck by a torpedo on the port side. This came very early in the initial Japanese air attack, the same torpedo attack that badly damaged Oklahoma, West Virginia, and California. When a bomb from the horizontal bombers detonated Arizona's forward magazine and burning oil began spreading across the water toward Nevada, it became clear to the more seasoned non-commissioned members of the crew that Nevada had to be moved or they would risk losing the ship. The minimum steam to move a battleship required two boilers, so Nevada was uniquely prepared among the battleships to get underway. Two very experienced warrant officers, one Boatswain and one Machinist, and also perhaps the most experience helmsman in the fleet, acting without orders, started chopping lines and barking orders to get Nevada moving. What normally would have taken a leadership team of several officers, a harbor pilot, and four tugboats two hours to accomplish, these men did in a matter of minutes. ww2dbaseJust as Nevada was beginning to move, one of her officers, a Lieutenant Commander, returned aboard and assumed the conn. Nevada was then very skillfully backed away from her berth, turned in place with port and starboard screws pushing and pulling in opposite directions, and then proceeded ahead into the channel, passing mere feet from the furiously burning Arizona. Ahead, in the center of the channel, lay the harbor dredge Turbine. Extending from Turbine to Ford Island was the dredge's floating pipeline that fully blocked that half of the channel. Maneuvering the lumbering capital ship around the dredge normally would have also required the assistance of several tugs but Nevada could not wait. With expert helmsmanship, Nevada glided close by the Ten-Ten Dock, around the dredge, and turned back toward the channel. These maneuvers came at a cost, however. To make her way down the channel on her own, Nevada had to move at dead-slow speeds at the very moment a wave of Japanese dive-bombers were commencing their attack. Seeing the Nevada underway, the attackers seized on this target of opportunity and subjected the battleship to a punishing bombardment. As much as the Japanese wanted to sink the Nevada in the channel to bottle up the harbor, the Americans wanted to avoid that very same thing. ww2dbaseWith one torpedo hit in the port bow and commensurate counter-flooding into the voids of the starboard bow, the Nevada was conspicuously down by the head. With fires still burning forward, the risk of sinking was very real. So as to not sink and block the channel, the decision was made to beach the battleship alongside the channel just past the drydocks at Hospital Point. The helmsman set the heavy bow against the bank as easily as he could. Just as the anchor was being readied to drop, a Japanese bomb exploded on the foredeck, killing the Boatswain warrant officer who was so instrumental in getting the ship under way. The outgoing tide created a down-channel current which, along with a light wind blowing in the same direction, swung the stern around so that the ship's starboard side was against the shore beside the floating drydock. ww2dbaseShortly after the beaching, the USS Shaw in the floating drydock exploded with a tremendous flash that was second in intensity only to the explosion of the Arizona's forward magazine. The rolling fireball rising from the Shaw was well photographed that morning and many of those photographs, particularly the ones taken from Ford Island, also show the Nevada beached along the edge of the channel. ww2dbaseThe bottom where Nevada was beached was not very flat so there was still a risk of the ship sinking and skidding over into the channel. Orders were quickly given for harbor tugs and other yard craft to assist Nevada off Hospital Point and beach her again against the side of the Waipi'o Peninsula opposite the Ford Island seaplane ramp. This time she was grounded by the stern with her bow pointed down-channel alongside channel buoy No. 19.
ww2dbaseWhile Nevada's sortie to Hospital Point was a short one, barely 12 times her own length, she was the only battleship to move during the attack and the sight of her making her way down the channel amidst the roiling black smoke was said to be a very inspirational sight for those in the harbor. Nevada suffered 60 men killed and 109 wounded during the attack. Both of the senior warrant officers who worked to get the ship underway, Boatswain Edwin Hill and Machinist Donald Ross, were awarded the Medal of Honor for their actions that day, Hill posthumously. Ensign Taussig was awarded the Navy Cross for his leadership in directing Nevada's guns and he also received injuries during the attack that later cost him his leg. ww2dbaseSome historians credit the Nevada's sortie with diverting the Japanese dive bombing wave from what had been their primary target of the drydocks and oil storage tanks. Not targeting the repair and storage facilities has long been considered a principal flaw in Japan's execution of the attack. ww2dbaseSalvage work on the Nevada began almost immediately and she was refloated enough to move back across the channel to the drydocks by 12 Feb 1942. She received temporary repairs at Pearl Harbor and sailed to Puget Sound Navy Yard for further repairs in Apr 1942. She spent the rest of the year receiving permanent repairs and improvements, including a greatly enhanced anti-aircraft gun battery. 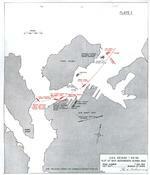 ww2dbaseNevada returned to combat during the Attu landings in May 1943 against the Japanese. In Jun 1944 she fired against German defenses during the Normandy landings in France, then again in similar roles in Aug and Sep 1944 during the invasion of Southern France. After relining her gun barrels at New York on the east coast of the United States, she returned to the Pacific Ocean and supported the operations in Iwo Jima and Okinawa in 1945. At Okinawa, she was struck by a suicide special attack aircraft and lost 11 men, but she continued to supply critical naval gun support for the ground troops. ww2dbaseWhen the war ended, Nevada was anchored in San Pedro Bay, Leyte, in the Philippines. While this was not the front row seat Nevada had for America's first day of the war, nor was it the front row seat for what may have been America's second-most important single day of the war (D-Day), to finish the war having served at Pearl Harbor, Normandy, Iwo Jima, and Okinawa certainly gave Nevada a particularly well-rounded summary of wartime service. ww2dbaseAfter WW2, the obsolete battleship was assigned to serve as a target during the Jul 1946 atomic bomb tests at Bikini Atoll of the Marshall Islands. She survived the blast, but she was poisoned with radiation. She was decommissioned in Aug 1946 and sunk by gunfire and torpedoes on 31 Jul 1948. 11 Mar 1916 Nevada was commissioned into service. 6 Dec 1941 Battleships USS Nevada arrived at Pearl Harbor, Hawaii Islands. 29 Aug 1946 Nevada was decommissioned from service. 31 Jul 1948 The battleship USS Nevada, having survived both sinking at Pearl Harbor and the Bikini Atoll atom bomb test, was finally destroyed as a target off US Territory of Hawaii. I wrote most of the Wikipedia article on this ship. :) Good job! Only thoughts: last sentence, third para should be "battleshipS of the United States" (plural) and shouldn't ship names be italicized? Cheers! To whom it may concern: I am trying to confirm that my father, J.L. (Jim) Pritchett, was a member of the USS Nevada on Dec. 7, 1941. If anyone has direction where I might find a crew list, or any other information that my point me in the right direction, I would be greatly appreciated. I am also trying to find a crew list, my uncle was on board the USS Nevada Dec.7th 1941 and it would be great to see crew list and maybe pictures of shipmates. If anyone could be of help that would be great. I am trying to find the crew list that may have my Grandfathers name, he was on the Nevada during WW I. Can anyone help? My granddaddy served on the Nevada. She was a great ship. I have his Nevada year book and other things from that time. It means so much to me. I am proud to know he served on the only battleship that got underway at pearl harbour. His name was Leonard Mason. My grandfather served on the Nevada from 1942 to 1945. Any yearbook he may have had & all of his medals were lost. I am trying to find pictures etc. for our family history. He is now deceased. Any help? my father Edward Mullins war at p.harbor.I would love to know more about him and his service time...How do I do this? I am interested in knowing if any images/pictures of the torpedo tubes on the Nevada or her sister ship (Oklahoma) (exterior/interior) exist and are available for viewing? Thank you. My grandfather was Ignacio Aguellon and was the bandmaster on the ship. I am looking for any information on him. Looking for crew listing around 1926. My father , Louis G Gombasy was with the Nevada at Pearl Harbor and received the Navy Cross for his actions. I am looking for anyone who has any information as to those actions other than in the official citation. I welcome any comments or opinions as to why he was singled out as there certainly many individual's actions that were equal in nature and at similar risk. Looking for info on my step-dad Alfred Cicillini and Cecil Macloud (my wife's Granddad). Both were cooks on the USS Nevada when it was bombed on Dec 7th 1941. My Dad Pete Skiba was on the USS Nevada during the Pearl Harbor attack. His usual assignment was as a mailman. I believe that under attack there was probably another assignment for a mailman to assume. Does anyone know what that assignment was? Any help greatly appreciated. My dad, Ray Goudie, was a Fire Controlman for the main batteries. He served on the Nevada shortly before Pearl Harbor, through D-Day to the end of WWII. He was one of the men responsible for the "legendary" accuracy of her big guns. After I retired from the military I became friends with Capt. Don Ross, winner of the Medal of Honor. My wife and I loved talking with him about his experiences on the Nevada. My father Arthur Kachoeff served on the Nevada from I believe Normandy, through the Pacific theater and also volunteered to serve at the Bikini bomb testing. I still have his cherished Nevada book, and formal black uniform. I'm very proud of him and his many friends whom I had the pleasure of meeting through the years of his life. looking for a crew list for the uss nevada for dec 7, 1941. The crew lists you speak of were called Muster Rolls by the Navy and they can be viewed at Fold3.com. There was not a Muster Roll specific to 7 Dec 1941 but the regular quarterly Muster Roll would have been completed on 31 Dec 1941. The previous Muster Roll would have been prepared 30 Sep 1941 with monthly updates of any intervening changes. Also, Muster Rolls only listed enlisted men; officers were accounted for in the Deck Log which are not available online so far as I know. My father served aboard BB36 from before Pearl till the end of the war. I have been trying to locate the final resting place of the ship. Several write ups say it was sunk southwest of Hawaii. However, a 2004 documentary shows an under water shot of the stern of “NEVADA” in a lagoon in the Marshall islands. Does anyone know the accurate location ? The Dictionary of American Naval Fighting Ships describes Nevada being sunk as a target ship off Hawaii 31 July 1948. Navy photo #80-G-498282 shows the ship sinking with a caption saying the same thing. Several years ago I found a flag at a local Goodwill. Hated seeing it there languishing, I purchased it, brought it home and was surprised at several things - it was on a cane pole, it had forty-eight stars and more than half of it is stained with oil. I get the feeling it was at Pearl Harbor on December 7th. Is there anyway to look at the crew compliments of those ships and cross match them with personnel who might have moved to Minnesota and perished here, especially near St. Paul? what is the thing in google maps that said uss neveda bb36 and it is onlty a rock? Nevada Muster Rolls list S2c Edward (NMN) Mullins, service number 287 52 62, was received aboard on 2 Sep 1941. They also show he enlisted on 13 Feb 1941 at Louisville, Kentucky. They also show he was transferred to the Naval Hospital at Pearl Harbor on 7 Dec 1941 but returned to the ship 6 weeks later. He then remained on the Nevada Muster Rolls until 20 Feb 1943 when he was transferred to USS Idaho. Knowing his service number, date of enlistment, and place of enlistment will be useful to you when you request a copy of his service record from the National Archives, which I strongly recommend that you do. To learn more about how to make that request, see https://ww2db.com/faq/#3. According to Nevada’s Muster Rolls, Seaman 2nd class Glenn Harold Muscato, service number 662 20 77, reported aboard 5 Aug 1942 in Bremerton, Washington and remained aboard until 4 Jan 1944 when he was transferred to the Naval Hospital at Chelsea, Massachusetts for treatment. The Muster Rolls do not say why he needed treatment and the ship’s War Diaries do not list any crew injuries leading up to this. At this time, the ship was putting in to Boston’s drydocks to repair storm damage sustained in the North Atlantic over Christmas 1943 so it is possible he was injured in those same heavy seas. The best source of information about your grandfather’s service would be his service record, which I wholeheartedly encourage you to obtain. See https://ww2db.com/faq/#3.